The International Academy of Arts is announcing its 29th edition of the Summer Festival, running from July 22 through July 30, 2019, in Antwerp. The professors and jury members this year are Francisco Barbosa, Nabila Chajai, Yu-Fen Chang, Hyewoon Cho, Minhee Kim, Sung-Ju Lee, Olsi Leka, Leticia Moreno, Ksenia Ovodova, Eliane Rodrigues, Tatiana Samouil, Takashi Shimizu, Mari Fujino, Zhao Yu, and Dirk Verelst (music director). 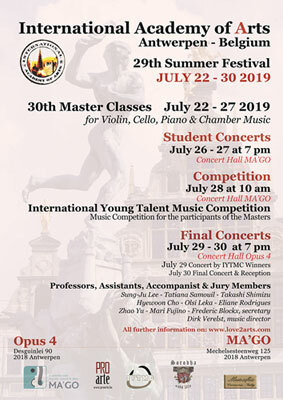 Our Summer Festival in Cremona, with a special thanks to Mr. Dimitri Musafia and Ms. Ilaria Casadei, has come to an end. The master classes for violin, viola, cello, marimba and chamber music were held by professors Sung-Ju Lee, Jenny Spanoghe, Marlon Dek, Ludwig Albert, Dirk Verelst and Naria Kim (assistant). The prize winners of the Academy Awards Competition are Joungha Kim, Sooin Shin and Seungyoon Kim. The winners of the Joy of Strings Awards are Hyunseo Cho and Sejin Park.